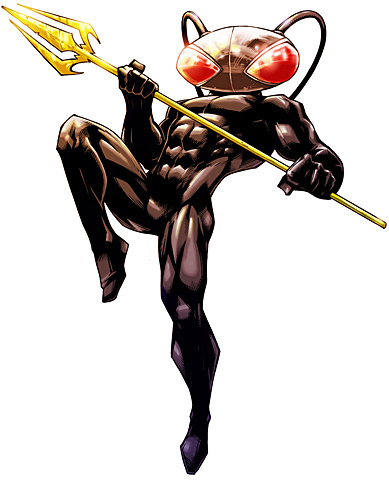 Suit: Black Manta wears a suit that helps protect him from the pressures of the sea and has an air supply. The suits helmet allows him to fire energy blasts and the suit itself contains concealed knives. Manta Form: At some point Black Manta was transformed by the demon Neron into a Manta hybrid. In this form he was completely at one with the water and could dive to extreme depths and survive. He had natural weaponry, a tail that he could use as a weapon. The process has since been reversed by Aquaman. There once was a young boy in an orphanage that screamed uncontrollably whenever he was put to bed. No one suspected that the feel of the cotton sheets was agonising to him. Nor did they realise that icy cold water has the exact opposite effect. The boy was severely autistic at a time before doctors understood the condition. As a result, he was subjected to experimental treatments, one of which seemed to bring the boy to a level of cognisance considered normal. It also brought out a streak of rage and violence. The boy saw images of Aquaman on television and was drawn to the sight of the man totally submerged in his beloved water. As an adult, the orphan designed a costume and fashioned a high-tech submersible inspired by the Black Manta fish and took the name Black Manta and sort out Aquaman.